The sun never set on the British Empire, until, of course, it did. We must face the fact that the United States is no longer the gravitating force in the motorcycle industry. Is it India? Perhaps. Royal Enfield is the oldest motorcycle manufacturer on the planet. It is currently owned by the India-based Eicher Group (since 1994). India-based Hero is the world’s largest manufacturer, which bought a 49% interest in Erik Buell Racing a few years ago. Hero is looking to come to America with a multi-model lineup and a respectably large dealer network. Royal Enfield may be following suit. Royal Enfield recently hired former Harley-Davidson executive Rod Copes to serve as president of RE’s North American division. 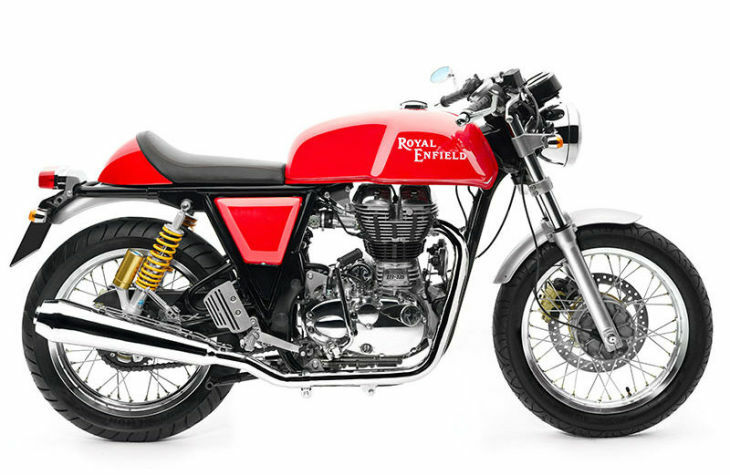 Copes intends to establish significantly more dealers for RE (currently just a handful) in the U.S. market, and is hoping the Royal Enfield models (including the Continental GT pictured above) will appeal to the large number of Americans currently pursuing simpler, retro-styled motorcycles. Royal Enfield is also producing a new 400 cc engine, which will be a more modern, powerful design than its current air-cooled single. That new engine will need new chassis in which to reside. Enter Pierre Terblanche. Where does this story about Hero being the world’s largest motorcycle manufacturer come from? Last numbers I saw, Honda was making 17.9 million units a year, Hero a little over 5 million. Yamaha makes more than that. it’ll never sell. jay leno may buy a couple. other than him, no one will buy it. its made to haul 5 poor people like the famous web pic: the pilot, kid 1 sitting on the handlebars, wife pillion with kid 2 on her back in a back pack, holding infant 3 to the side in a 5 gallon bucket. It might be the perfect type of bike for District 12, or most of India. As long as we still live in a complex world with good roads complex bikes are fine. I really like this bike. The problem for me is that IT HAS NO BALLS. Irregardless of whatever spin RE’s public relations people crank out, this bike, with its double downtube frame, is screaming for the updated Series 3 twin to be dropped in it. Look at web images of the 1971 Rickman Enfield Metisse and you’ll get the idea. I think RE has a lot of potential.. they have the look and the name, now if they can just ramp up on their product engineering and QA they’re poised to go big. I’d love to have one but they’re reputation has always been a little sketchy re: quality. Get past that and they could really take off. I sometimes wonder if the constant push towards higher and higher performance has killed of a lot of interest in modern motorcycles. You almost can’t find a bike that is tame enough for a truly novice rider. If the novice does find one he/she is almost always shamed into getting a larger/faster/heavier bike. I think that tends to intimidate new riders so even if they start riding, shortly after they quit. Note how many very low mileage newer bikes are being sold every year. New riders get them try to ride for a while scare themselves and then sell it. Not for them they say. I can’t remember a time when the choices for novices was this broad and appealing. There are some truly great machines out there in the 250cc – 500cc displacement range that can serve any riding segment, now with antilock brakes even. I do think you are correct about the novices feeling pressure to get on an inappropriate first bike, though. That is a shame. I hope the new offerings out there change some minds. wonder no more, GENERATING interest (like so much Grand Coulee) is what it does. Honda’s ENTIRE line up says those people are out of excuses. make no mistake the attempt is GOING to happen. but lets be clear, nobody can shame anyone into anything…? however one can certainly ALLOW themselves to be shamed into behaviour modification. oh yeah, minds are weak and “group think” is strong. no no, your thinking of the first CRASH. that little dose of REALITY is what makes ’em quit. motorcycling… separating men from boys and cutting “wheat” from “chaff” since 1894. I think Mr. Whitton may have a point. I know a number of people who started riding and quit because of a close call or because they could never get “comfortable” with the bike. Crashing merely provides further incentive. #2 unbeknownst, you’ve just stumbled upon people who were never destined to join the ranks of the BOM (Brotherhood Of Motorcyclists). i mean if that’s all it took to send them screaming for the hills, well…? motorcycling’s not easy. it takes energy, commitment, perserverance. My wife used to “run for the hills”. Her first learning experience was on her brother’s Harley when she was about 19-years-old. After nearly dropping it in a ditch (target fixation!) getting her first start in the yard, she was certain motorcycles were death traps. Ten years later, she started trying to learn to ride my SV650. She accidentally wheelied it in a parking lot whilst being not so smooth with the clutch and throttle. Motorcycles are rolling coffins. Fast forward another 10 years, and she is now talking about getting a scooter or small displacement bike after zipping around for a few days on a 100cc dirt bike. Motorcycles are pretty cool. She gets why I like them so much. I am dumbfounded. While I totally agree with you that there are some people who just shouldn’t pilot motorcycles (even people who are already members of the BOM), I also think the right first experience is important to determining who is destined be part of the family or not. For that, the right bike can be everything. Which is a problem in and of itself. Our “ranks” are small and shrinking. Because of that, motorcycling looks more dangerous and unreasonable to the curious. And that the above is a real possibility doesn’t help. We of the “BOM” handle our bikes without worry for things like this, much like most adults can handle scissors without cutting themselves. To someone who doesn’t ride, that the bike could be FLIPPED OVER by accident, or that a little road sand could cause a fall is unacceptable, and they’re walking away. Novices don’t get to grow up anymore on GT80’s, CT 70s and XR 75s learning to steer and brake in the dirt and how hazardous falling can be before they get some real power (anything 250cc and bigger) and head to the asphalt where those same lessons have far greater consequences. That is a good point, Mickey. Dirt is certainly the best teacher. I know I am a better rider because of it. My first motorcycle was Yamaha RT180 dirtbike – a rocket compared to bikes you mentioned. I am lucky to be alive, but I probably wouldn’t be if my first ride was even a moderately powerful street bike. In hindsight, I definitely could have learned to ride with far less pain on a slower bike and learned more quickly too. All the extra power did was help me fall more quickly and spectacularly. But it also lit my adrenal glands on fire. I wonder if I would have developed such a passion for motorcycles on something slower at that age (18 – rather old to start learning) or if I would have gotten bored with it. It takes a pretty mature person to buy a smaller bike when a R1 is the fuel behind getting that motorcycle license. I think a lot of people that come into motorcycling late almost see that first purchase as their shot at a dream rather than an opportunity to learn. That is the wrong way to go about it, but I completely understand. Novice bikes are so good now that hopefully that those bikes can serve as the dream and the teacher. I raced MotoX for about 10 years, starting in 1973 at the tender age of 23 on a Yamaha MX 100. I had already been riding for 8 years on the street. I always said the dirt racing made me a better street rider and the street riding made me a better racer. Cosmetics are A+. A student or faculty member at Utah State U ride an RE. It looks and sounds sweet as candy. I welcomed the recent images of Kawasaki’s fantastic looking street triples too. It’s amazing how beautifully designed were these machines. They look so well balanced and proportional, infinitely better than most bikes released later, especially Japanese. The bike is beautiful just the way it is…give it 40 to 45 hp and any minor frame and suspension mods necessary to accommodate the new power, and it will be right in line with the original 60’s cafe racers. And that means it will be just fine for those looking for that kind of bike. Royal Enfield sold 74,600 units into India alone in 2011. H-D sold 235,000 units worldwide in the same period. What makes you think the hiring of Terreblanche even impacts on Eichers’ thinking of the USA market? If you buy them, great. If you don’t, why do you think Royal Enfield cares..? The battleground is, as noted earlier, in the INDIAN market, where Honda, Hero, Bajaj, Triumph, R-E et al are battling for the newly-affluent and emerging middle class recreational rupee, as well as creating a market that is above and beyond the utilitarian bog-basic transport that has been the core of the Indian market to this point. If Terreblanche creates a design that has overseas appeal he has served his purpose, great. R-E earns currently a place in those markets through idiosyncratic old-fashion-ness. Anything that expands on that appeal is going to be useful as image provider and aspirational indicator to young, upcoming Indian professionals. But how many USA motorcycles are sold with flip up side racks that serve as extra luggage capacity when not serving their primary purpose of rear wheel guards to prevent Sarees getting caught in the spokes when the women ride pillion, side-saddle? Certainly no coincidence that Harley-Davidson and KTM are manufacturing entry-level bikes in India, as well as Triumph and Ducati in Thailand. Honda also has opened a design center in India. India and China are motorcycling’s two largest markets are manufacturers will be catering to them, look at some of Honda’s latest offerings, more scooter like than traditional motorcycles. Comfort, reliable and cool are the goals…so RE looks to get a design that fills that niche in a demographic at price point and there you go. I see Honda selling 500s to 750s and Yamaha has MT 07 etc and all the Japanese and Ktm making sub 400cc bikes.someone wants a bike that gets them around the city and B roads and down the bigger highways once and a while for short stints…Terblanche..didn’t he do the MH900e as well so stop knocking the 999 already…it was not T’s designs that hurt duc it was desmo valve adjustments and belts etc that made service a nightmare of $$$$ beyond initial price etc. I rode a C5 classic the other day and was hooked. The engine format must remain the same or it will just be another big single with no signature. Long stroke, heavy flywheel. I live in New Zealand and I could think of no better bike for a pleasant plod around the countryside or exploring the gravel roads. Modern styling leaves me totally disconnected. I would enjoy a morning with a cloth and alloy polish. But then I grew up with Nortons in the sixties and seventies. Has it maybe occurred to anyone that Royal Enfield wants Terblanche to design their 400 to maybe sell in their home market? It has enormous potential for growth unlike the market in North America. If Terblanche designs a winner for India they will have a REAL winner, sales wise. All this talk of RE needing to build large singles or twins that do or do not vibrate and are as reliable as a stone ax in order to possibly sell some to us here in North America is kind of precious. Too small a market. Too fussy a buyer. Too many other manufacturers that everyone thinks Royal Enfield needs to emulate in order to sell bikes. I like the mobile paint mixers they make now. I think they would love to sell us our very own dream machines, but the profit smells just as good whether its made here or in India. …too many supercharged Ninja H2’s. Damn straight. Nothing says progress like Royal Enfield. I’m not seeing myself on one however. Two years ago I bought a used ZZR1200 with 2000 miles on it for far less than a new GT. I’m not thinking I made a bad choice. It won’t sell in large numbers in America until it is as reliable as a Honda. Americans just aren’t that talented with roadside repairs that require duct tape and bailing wire. FAIL in the USA until they hire talented engineers instead of high-paid artists to solve their problems. Remember the Honda GB500? It was their attempt at a retro single cylinder café styled bike. It didn’t sell in large enough numbers to justify continued importation. I think that the “retro café” look just doesn’t appeal to enough mainstream customers to sell beyond niche numbers in the U.S. market. If it was availible today, “my guess” is it would be selling – same with the Kwacker W800. Triumph sells a good many. Perhaps being British allows them to pull that off, or perhaps the extra displacement and cylinder seal the deal. Or perhaps the combined sales of all of the Bonneville variants allows the Thruxton to exist. Yes, it underperformed at the time, as did the excellent NT650 Hawk GT (had one, loved it). They were both excellent ideas at the wrong time. Try to find good used ones now. They are valued far higher then most all of the bikes that outsold them at the time, if they’re for sale at all. It will no doubt create the best looking POS on the road. Bryan W., I was in Taiwan a year and a half ago and was equally amazed by the number of scooters…..until I got to Hanoi in northern Vietnam. Obviously for a large percentage (or most) of those folks in both countries, those scooters were their only transport. I too imagined the challenge of renting a scooter and riding along with them. It would have either been scary or a blast, or both. Many intersections in Hanoi were without light signals or signs. Getting back to the point, I will continue to follow RE’s progress and see how they’re reviewed with the new engine. I love their looks. I’m rooting for Royal Enfield. BUUUUT, who in their right mind would have anything(one) from Harley anywhere near their management/distribution team? Ducati, heck yeah! Terblanche only had one semi dud with the 999, and it was a very good improvement on the 998 but the styling was something only a mother could love. Balance the motor. It’s 2014. Shorten the stroke at least so it does not shake itself to death. Pierre needs to tell them about the motor first. That is what moves the machine. The design of the bikes from a looks perspective are not bad. But bring them up to 2014. Nostalgia is not worth the money. He did the 999? The older that bike gets, the better it looks. I agree. That design was a bit ahead of its time. I though it was an insult to the 996 it replaced when I first saw the 999. Now I think it is the better-looking bike. Correction – 998, not 996. Yes, agreed. I think its styling has aged well – unlike its successor the 1098 which looks rather generic, like a 916 that has eaten one too many family sized pizzas. Royal Enfield needs to revive the Interceptor. Develop an all new ~750cc parallel twin, house it in a full retro chassis, updated with modern electrics, brakes and suspension. The formula has worked for Triumph, Ducati and most recently Honda with the CB1100. If RE can go a little more retro than those firms and keep prices down, there should be room in the market for them. Yes, I agree. Actually Kevin Mahoney (RE USA) told me years ago that RE was is development on reviving the Interceptor. That was awhile ago and I haven’t seen or heard anything else. Sure would be nice to see another parallel twin in line with Triumph, new Norton and maybe Kawasaki will rethink bringing the W800 into the US. Terblanche has birthed a lot of duds, but don’t forget he also designed the Ducati Supermono, one of the most gorgeous motorcycles ever created. If anything can drive a stake through the heart of Royal Enfield it would be Terblanche. Nobody can do ugly like that guy. he can do beautiful as well, he did the supermono and sport classics and a few others, but I’m not sure what any of that has to do with Enfield…? unless it’s just a move towards an ocean of Rupees. IF ROYAL-ENFIELD WANTS TO MAKE SPLASH IN THE U.S.,IT WILL NEED A TRIUMPH BONNEVILLE TYPE OF BIKE. 650CC PARALLEL TWIN ETC. Make a splash with who is the real question? Smart money would be on going after the same group as HD is targeting with the Street. That’d mean making the bike above a little newer tech without losing any of the look, with a low entry price. Dave, on this point I disagree. Many RE owners are buying nostalgia in a 2nd or third bike. The HD 750 is a first bike for newer riders. When smaller displacement bikes dried up here in the US I knew the market had changed. Did increasing performance drive everyone upward leaving few wanting the smaller bikes? What we did was paint ourselves into a corner. The US is so very driven by H-D that it was the only real McCoy. Anything else was a pretender and not worthy even though some possessed greater comfort, greater performance, and/or at less cost. Those bikes were impostors. Then you had the opposite end of the spectrum that even to me seems driven by hoodlums or the need to act and be seen as one. Welcome to the US motorcycle scene. Royal Enfield needs an across the board improvement in quality. That includes mechanical engineering as well as fit, finish and pricing. In the US, Enfield is viewed as a “third tier” brand. Quaint, but not reliable. Retro, but not even close to the standard of the industry. Better bring your tool kit. I don’t believe that hiring Terblanche will elevate the brand. To my eyes, his designs have always had a “niche appeal”, but are far from mainstream (in fact, I think most are just plain ugly). Niche designs are fine if you have the base market to allow that kind of indulgence. RE isn’t there yet. I just read they sold over 26,000 motorcycles in August 2014 alone, over 190,000 units for their most recent fiscal year. Pretty good base market if you ask me. I agree that hiring Terblanche isn’t anything of great significance. RE seems to be trying to add some credibility to the brand by associating with an industry celebrity while what they need is improvements in quality / value as you pointed out. Personally, I think they are doing pretty good on the design front without Terblanche. This is the authentic point. What will it take for them to “redefine” themselves? Its been a slow slog for Hyosung – and they are a long way from breaking out of the “Third Tier”. I couldn’t agree more. 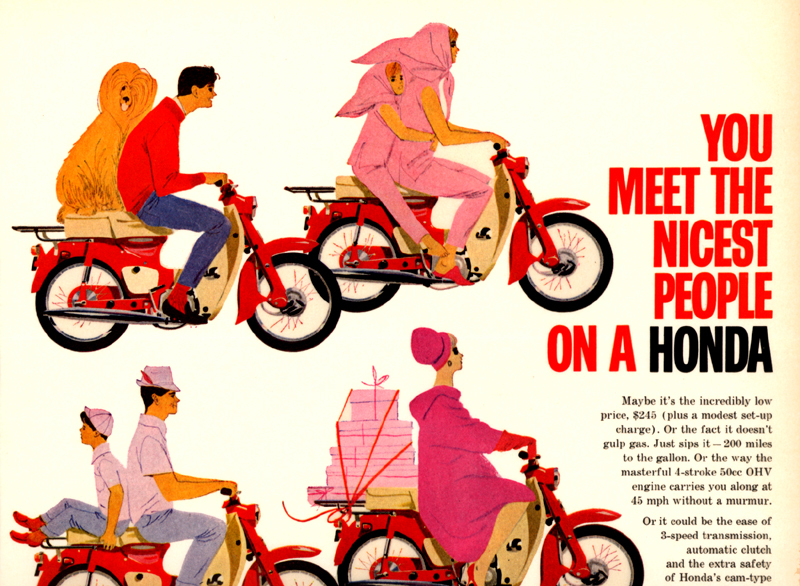 They accomplished what they did by offering motorcycles that the average person could afford to buy that competed with – but were notably different than – bike in the segments they were targeting. However, I do think the Triumph name was a great asset in their mission: not the case with RE or Hyosung. For us over here, they take one of those millions of small bikes, change the bodywork, change the name of the bike, and sell it here with the sales blurb that it’s coolest little bike you ever needed. Meant to reply to Bryan Whitton’s post below. Not even motorcycle world can avoid ‘culture’ of celebrities. If “Royal Enfield is the oldest motorcycle manufacturer on the planet (1901) ” Then how can Harley Davidson (1902) make the same claim ? or Indian 1901? Or Triumph 1902? or Harley 1903? Harley only claims for U.S. as does Indian although Indian was out of business for 60 years. Triumph doesn’t claim it’s the oldest, it only claims it’s been making motorcycles since 1902.
so technically since Royal Enfield has been making motorcycles, I believe continuously since 1901, they have a right to claim they are the oldest motorcycle manufacturer on the planet. Actually, “Royal Enfield” ceased motorcycle production in 1970. In an tail that’s equally strange and convoluted, the brand went out of business, took their turn in the whole Indian MoCo story when they were temporarily badged as Indians in America, then was sold to Enfield of India…who, strangely enough, had been building Enfields all along under a licensing agreement since the 50s, but did not buy the ‘Brand’ until the 90s. Really, the whole “who is oldest” claim, and its accompanying arguments, is truly silly. Both of the original owners of Indian Motorcycles had left the company by 1910 or something like that…so does that mean anything after that is “not a real Indian”? I mean, its not the original owners…Harley was purchased by AMF in 1969, but you never hear anybody say “that’s not a real Harley” about anything made since. Does it really matter? Not once, while enjoying the wind in my face, have I EVER contemplated the progeny of the brand I was riding. Doesn’t mean squat to riders, history means something to historians. As far as I know Sachs is the oldest still running, started making bikes in 1897. Peugeot has been making motorcycles since 1893 and is still going strong (all scooters now tho). Sachs didn’t produce their first motorcycle until 1904. So long as scooters still count (I think they do), Peugeot gets the prize. Thanks a lot you two. I have never considered scooters ” motorcycles” they are scooters, but you do bring up interesting points as far as 2 wheel gasoline powered conveyances go. I think traditionally the Hildebrand-Wolfmueller has been considered the first ” production motorcycle.” But of course went out of business long ago. As far as Terblanche goes, imo he can do little to improve the looks of the current Royal Enfields, they actually llok quite good considering, but maybe he can do something with a newer larger offering. Yes a revised Interceptor would be cool. It sounds like Royal Enfield got into a poker game with Confederate Motorcycles, went all in, and lost really big. Terblanche is self-damaged goods. He is a highly over rated, has been, who has barely exceeded a year at each of his last three stops. None of his bikes have sold well for very long. When this doesn’t work out with RE, he will have blown too many second, third, fourth, fifth, …. chances to be able to do much more than shave poodles. Mercy on what those poodles will look like. They will be laughed at even by afghan hounds. Err.. You may not be familiar with this guy’s designs. Aside from an under-performing (sales) Ducati 1098, his stuff has been widely celebrated. The RE brand will be more compatible with his retro tastes. No, I am familiar with his work. His only well received designs were when he was working early on under the tutelage of Tamburini. The Supermono was one, but it was mostly a scale-down of existing model. Post-Tamburini, he has bombed without the interruption of success. The first generation of the Multistrada seemed to be mocked for its design far more than it received even tepid approval. It had some sales dampening design related flaws such as terrible seat comfort and wind buffeting issues. the 2010 redesign carried nothing over in the style department. It hit a market in free-fall from the recession and far outside the original one. The sport classics range failed even though the vintage cafe bike market was starting to pickup. He has been with four makes now since 2008. The Confederate concept is about there is to show for the last three. His problem is just that he is always ahead of his time. The Sport Classics were a sales failure when Ducati was building them, true. Now try and find one in good shape for less than they sold for new. The 999? Again, a failure – traditionalist Ducatisti wouldn’t accept the fashion-forward design. Nowadays it looks brilliant. This is Ducati, not Honda. As a sales success, most everything Ducati does is a failure compared to the Monster. He also did the Hypermotard, the ST3 & 4, as well as the new Norton everyone is clamoring for. The multistrada was not mocked, it was celebrated and won many awards (funny though, your comment about it paraphrases the Wikipedia entry almost perfectly). The guy’s designs are ground breaking and well respected in the design world (outside of motorcycling), who mostly recognize him as masterful. You are on the wrong wavelength dude. He was talking about the 1st generation Multistrada not the 2nd gen. The 1st gen was seriously mocked. Easily the worst looking Ducati ever no competition what so ever. And I never heard of Terblance’s design being described as “ground breaking”. He can do “conservative” rather fine but, step out of it and all hideous breaks loose. Look at his latest Confederate thing. Looks totally Amature. Form without function. He’ll do OK at RE as long as he can contain his urge for uglies and stick to conservative. The fact is that he is no Tamburini. Doesn’t even compare. He is more talented in selling himself than designing. I know he meant the 1st gen. It was not “mocked”. It won awards and sold well. When bike models flop, they don’t invest in updates and continue building on a failed brand. Look up the reviews from the 1st gen. They start with a comment on its unusual looks and then universally go on to praise the bike’s capabilities. Are the newer ones better? Sure they are. That’s true of most long running bike models. It doesn’t make the predecessors bad. Seriously? 1st gen wasn’t mocked? It was widely praised? Just because something came from Italy doesn’t mean it’s beautiful. “Unusual” is an euphemism for umm… I’ll refrain saying what. That thing had looks only fanboys can love. I guess we’re not on the same planet. Huh. and twig on the way down. It was also commonly referred to as looking more like a kitchen appliance than a motorcycle. Others said it looked like someone took an ugly stick to the Cagiva Gran Canyon (also designed by PT) and beat it without mercy. I remember digs were pretty common about Ducati raiding a bin of reject Star Wars props. There were some comparisons to various deformed animals. I get the appliances and Star Wars props linkages more than various animals and birds. Nothing’s about it looks bio-organic to my eyes. The Wiki description of the bike’s flaws contains no information that wasn’t widely known and published to death when the bike was contemporary. I just got back from a business trip to Taiwan and now understand what they mean that the US isn’t the center of the motorcycle world. OMG the number of scooters is just unbelievable. Whole families on them at once, they didn’t have milk racks on the back they were huge plywood bins used for delivery. A family of 4 with a dog all riding together. Oh, and BTW the lines on the road and the lights overhead are for decoration only. In the limo going to my hotel we turned left onto what was labeled a one way street and were engulfed in a swarm of scooters all going the other direction! I would really like to rent a scooter in Taipei just once to see if I could travel there like they do. Just the shear quantity of scooters in enough to make you understand that the market in the US is a joke. No wonder that they just don’t care if they have a racer in MotoGP from the US. The market is too small to worry about. Also make you wonder why Honda, Yamaha, Kawasaki, and Suzuki refuse to make and import into the USA that one bike that everyone says they should have made years ago. I am beside myself excited about Royal Enfield’s progress. I hope they are as reliable as they are unique. I can see myself owning at least one.